A Canadian woman and the nephew she took to court over a lottery win have come to an agreement over how they will split the jackpot. Barbara Reddick sued Tyrone MacInnis in July for his half of the C$1.2m ($912,000; £690,000) win. Both their names were on the winning ticket from a "Chase the Ace" draw in rural Nova Scotia. Ms Reddick, who bought the original ticket, will get C$872,639 - the bulk of the winnings. 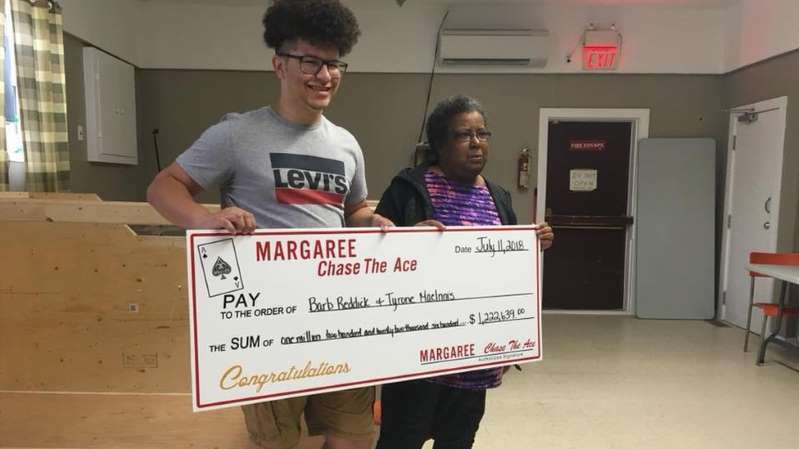 Her 19-year-old nephew will receive C$350,000 from the charity draw in the small town of Margaree Forks. "They are both satisfied with the terms of the settlement," Ms Reddick's lawyer told the BBC in a statement. "It was reached mutually in order to avoid further court proceedings and to bring this matter to a final conclusion." Ms Reddick claimed she never promised to split the jackpot with her nephew and only put his name on the ticket for luck. At the time, she told reporters that she had offered to share possible winnings from a smaller draw, not the jackpot. Her first act upon winning the lottery was to threaten to sue her nephew over the 50-50 split of the win. "I'm taking him to court," she told those gathered at the winners' ceremony in July. Last month, a judge froze half the amount of the contested lottery prize - the portion awarded to Mr MacInnis - pending the legal action. Ms Reddick's lawyer says the two are now looking forward to putting the feud behind them. Chase the Ace is a lottery game popular all over Canada's east coast, and often raises money for charity.